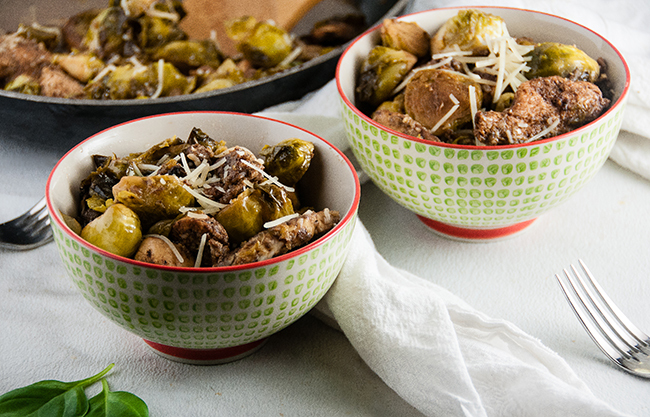 This Parmesan Balsamic Chicken and Brussel Sprouts Skillet is January food. But better. You know about January food right? The food you eat for the first few weeks each new year trying to shed the holiday fluff. Yeah, that food. It gets a bad rap a lot. I mean, I totally understand how it would. After a fall full of comfort food like pumpkin penne with peas and Parmesan and Parmesan garlic twice baked potato casserole, it can be a let down. 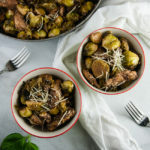 But this Parmesan Balsamic Chicken and Brussel Sprouts Skillet is not a let down even though it’s healthy and perfect January food to go along with those New Year goals. And I think I know why. I see the common thread here. It’s the Parmesan cheese. I mean, Parmesan cheese is kind of magical isn’t it? It’s so delicious and flavorful. Even Goose, who is currently Princess Picky, loves Parmesan. No kidding. I’m pretty sure she is currently keeping herself alive on a diet of grated Parm, chocolate milk, and the occasional hunk of Play Doh. Let me paint you a picture of this. Imagine if you will dinner time on any give night. Now Mommy is a food blogger and Daddy also loves to cook so generally dinner is something delicious like Crock Pot Bolognese or Vegetable Soup with Quinoa. So each night, homemade food goes on the table and on her plate. Dinnertime with a toddler. At least she uses please. It’s the little things. Well, at least she is filling up on Parmesan. I mean it is one of the yummiest cheeses. 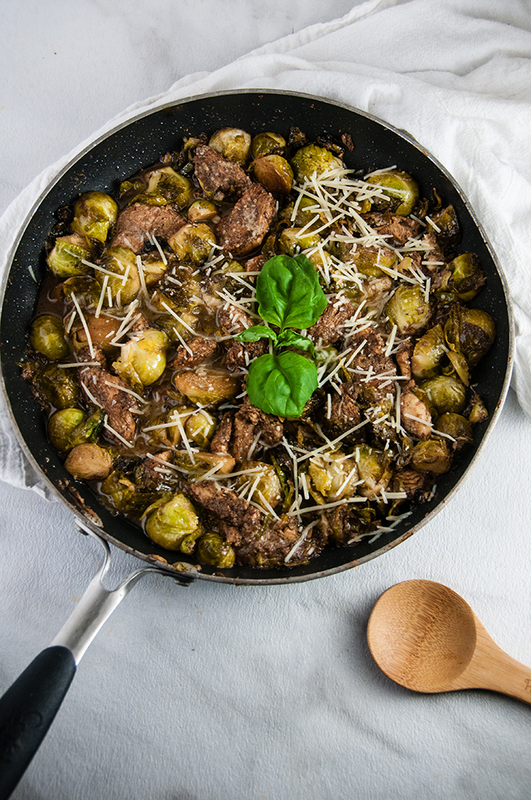 And a little bit of it goes a very long way in this Parmesan Balsamic Chicken and Brussel Sprouts Skillet. 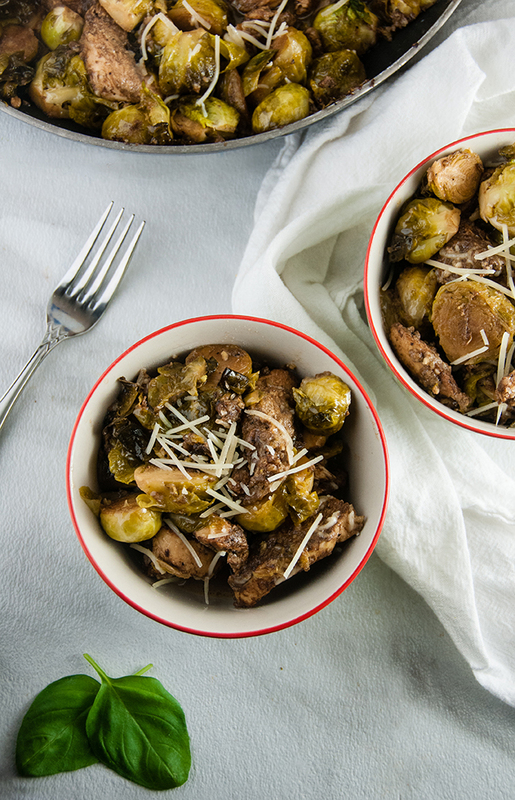 It’s the combo of the slightly salty cheese with the sweet and savory Balsamic that dresses up the chicken and Brussels so nicely. And this dish is one of those dishes that doesn’t need a lot of time or a lot of effort to put together. It’s sort of a paired down version of my Autumn Chicken Skillet, but with more delicious Brussels and even less effort. Plus, it’s healthy and hearty and can stand alone as a meal or would be awesome over rice or quinoa. See, January food. But better. A quick and easy healthy meal of chicken and veggies on the table with only 1 pot and in under 30 minutes. 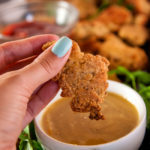 Cut chicken breasts into bite sized chunks. Put in a bowl with with 1/3 cup of balsamic vinegar and 1/4 cup of olive oil and 6 crushed garlic cloves. Season with salt and pepper. Allow the chicken to rest in the marinade while you heat a tablespoon of olive oil in a large frying pan over medium heat. Add the Brussel sprouts, 1 tablespoon of balsamic, salt and pepper and remaining garlic cloves to pan. Saute the mix for 8-10 minutes until the Brussels start to soften. Add the chicken mixture and cook for an additional 8 minutes or until the chicken is cooked through. Flip half way through. Just before removing from heat, add the Parmesan cheese and stir to combine. Serve alone or over rice or quinoa. Yum! Saving this! I LOVE LOVE LOVE brussel sprouts! Heck yah I just pinned this. Looks delicious! 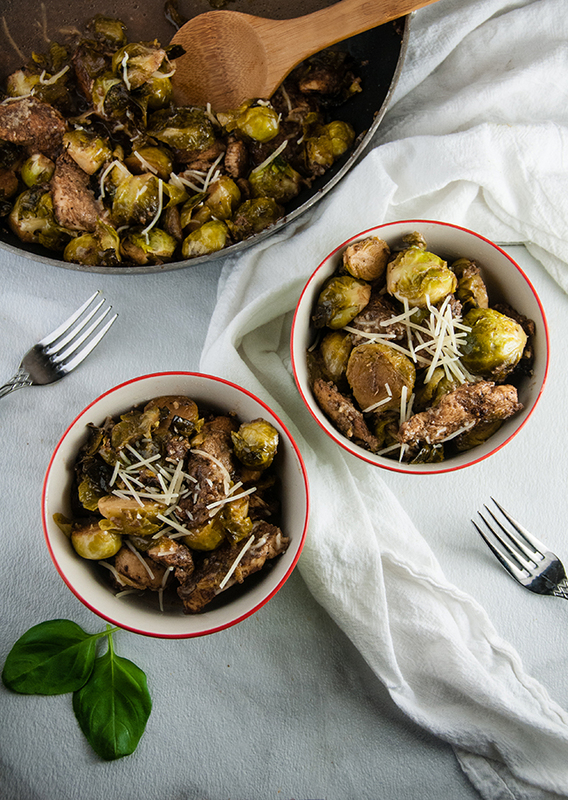 I love brussels sprouts and this recipe looks so healthy, easy and delicious. The parmesan must compliment the taste. Can’t wait to try this out! 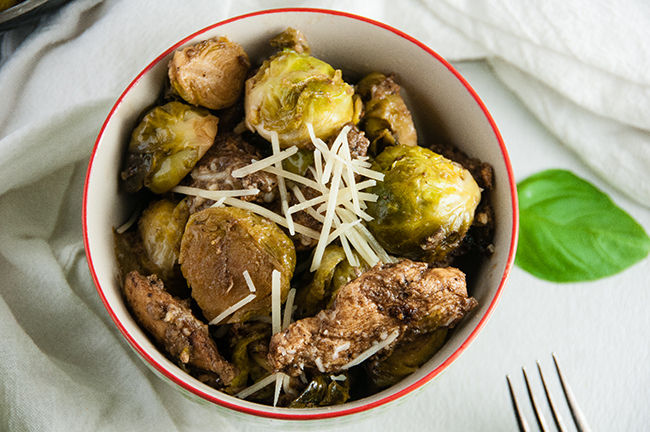 I’m not crazy about Brussels sprouts but the chicken I’d def love. Gonna give this recipe a try, it’s probably delicious! Looks healthy too! Give brussels another go and try cooking them differently. I’m not a fan of plain brussels either. Brussels sprouts and balsamic! 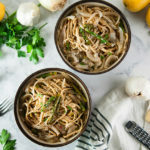 My two favorite things – this recipe looks so delish! Such a good combination, isn’t it? Yummy! This needs to be added to my meal prep ASAP! I totally agree with your kiddo – everything is better with parmesan (and I’m sure the dog doesn’t mind getting sprinkled with it sometimes!) 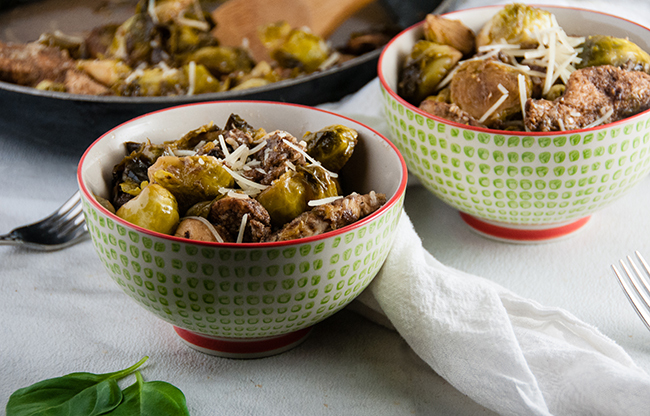 This recipe looks great – I love Brussel sprouts that have been gently roasted. Definitely need to add this to my list to make! You’re right! The dog doesn’t mind at all. Just shakes it off a la Taylor Swift and then licks it off the floor. 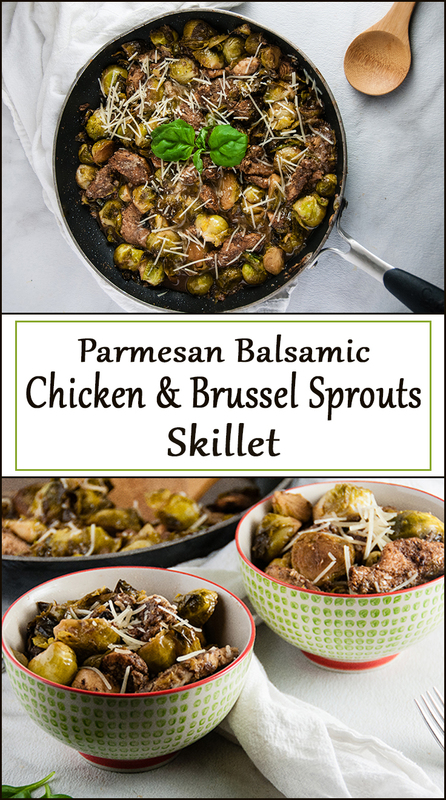 I need to make this on a night when it’s just me… I’m alone in my love of brussel sprouts! The husband and I both like Brussel sprouts. The kid…well…I’m not sure she likes anything! 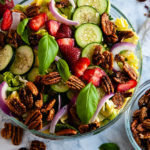 Oh this Brussel sprouts recipe looks so good and something I know I would love! Thank you for sharing! Give it a try. They have so much flavor! This sounds delicious and not nearly as difficult as I imagined!! Can’t wait to try it! I am always looking for new brussel sprout recipes. Thanks! 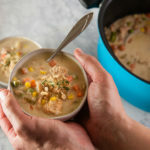 I’m a fan of keeping cooked chicken in my freezer for putting together quick meals. I also had a bag of fresh brussels sprouts so just HAD to try this. I added the chopped cooked chicken to the brussels sprouts after they were softened along with the extra balsamic vinegar. Also added a chopped Gala apple to add a bit of sweetness and make this an even more complete meal! Delicious!